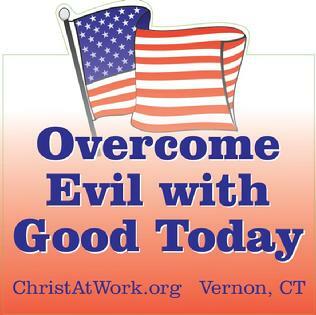 We're here to overcome evil with good! In the immediate aftermath of the horrific workplace massacre at Sandy Hook Elementary School in Newtown, CT on Friday, December 14, 2012, we launched a campaign based on St. Paul's writings to the Romans. In Romans 12:21, he says, "Be not overcome of evil, but overcome evil with good." The week after the tragedy, we submitted Letters to the Editor to many daily newspapers across Connecticut, as well as to the Wall Street Journal, New York Times, and USA Today. We also created attention-grabbing, patriotic lawn signs that our volunteers can place in front of their businesses, homes, churches and high-traffic locations.Please use the free artwork below for church bulletins, Avery 5160 labels, and logo artwork that you can copy and paste to help to get the word out!